The Sacramento County Sheriff’s Department says two deputies were shot, one fatally, Monday afternoon in Rancho Cordova. 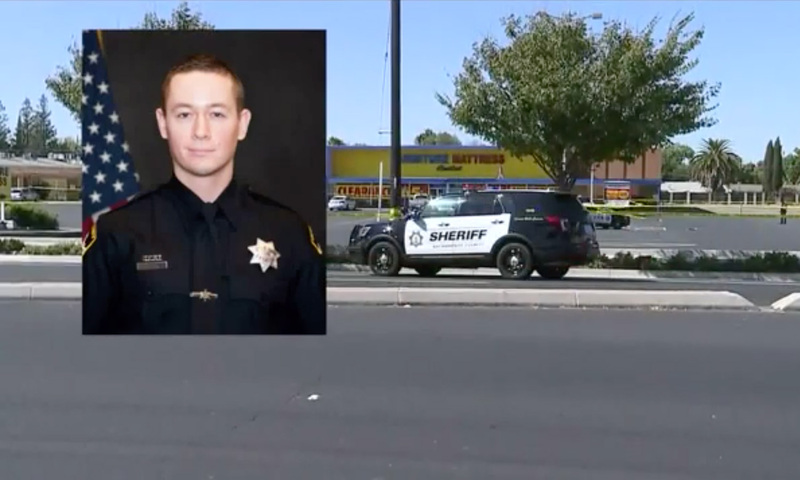 The deputy who was shot in the upper body and later died was identified as 27-year-old Mark Stasyuk, according to Sacramento County Sheriff’s Sgt. Shaun Hampton. Stasyuk had been with the sheriff’s department for four and a half years. He died at UC Davis Medical Center. “I can tell you that the fatal round was not in the vest,” said Sacramento County Sheriff Scott Jones. According to Jones, just before 2 p.m., officers responded to the Pep Boys on Folsom Boulevard, where there was a disturbance between a customer and the business owner. Jones said the officers were expecting a “routine call” and did not know anyone would be armed when they arrived. Jones reports when the officers got to the store the suspect appeared to be turning away to run from them. Instead, he immediately turned back around and began firing at the officers “without warning,” Jones said. Both Deputy Stasyuk and Deputy Julie Robertson returned fire and were wounded, according to Jones. The suspect then ran from two other officers, ignoring their demands. Jones says the officers also shot at the suspect. “Had to have been more than at least 20 shots,” witness Steven Green told FOX40. Deputy Robertson, who is 28 years old and has been with the department for two and a half years, was shot in the arm. She is expected to be OK, according to Hampton. An uninvolved bystander was shot in the gunfight. Jones says he believes the bystander was shot in the back but his wounds are not life-threatening. “There was also a bystander shot. It is unknown at this point whose rounds struck that bystander. Our detectives, homicide detectives, as well as other investigators, are currently on the scene trying to figure out exactly what took place,” Hampton said. The shooting suspect — later identified as 38-year-old Anton Lemon Moore — was wounded and taken into custody, the sheriff’s department said. He is expected to survive and was speaking to officers at the scene before he was hospitalized, according to Jones. Moore has not yet been booked into jail, Hampton said Tuesday morning.